Jose Mourinho has been fined after continually arguing with the officials in Chelsea's 1-0 defeat to Aston Villa. 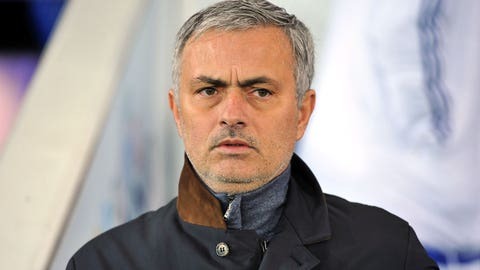 Chelsea manager Jose Mourinho has been fined $13,000 by the Football Association and warned as to his future conduct after re-entering the field of play during last month’s Premier League game with Aston Villa. Mourinho came onto the pitch to remonstrate with referee Chris Foy towards the end of their 1-0 defeat at Villa Park on 15 March. The Blues boss requested a personal hearing with the FA on Wednesday but they decided to punish him for his actions. Chelsea ended the match with only nine players after Willian and Ramires were sent off, with the second dismissal leading to the incident with Mourinho. Ramires received a straight red for a two-footed challenge on Karim El Ahmadi, with Mourinho then coming onto the pitch to speak to Foy, who subsequently sent him to the stands. "Chelsea manager Jose Mourinho has been fined Â£8,000 and warned as to his future conduct following an independent regulatory commission hearing," the FA statement read. 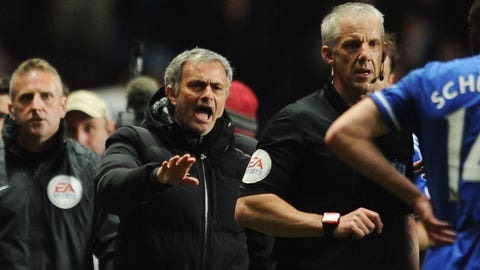 "Mourinho denied a breach of FA rule E3 in that his behaviour in re-entering the field of play and approaching the match referee (Foy) in an attempt to speak to him, in or around the 90th minute of the game against Aston Villa on March 15, 2014, amounted to improper conduct. "However, the charge was found proven at a personal hearing on Wednesday, April 9."